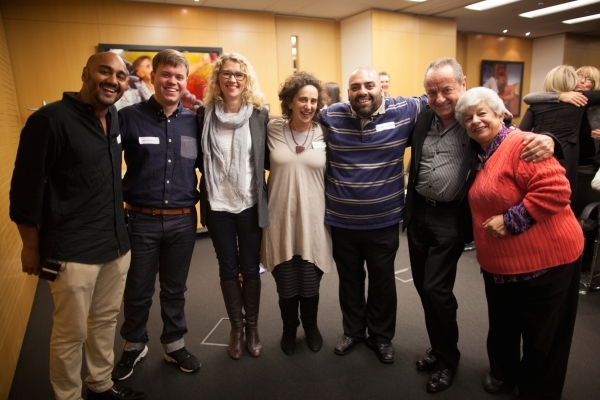 With the outstanding success of its latest Sydney event in association with Creative Partnerships Australia, The Funding Network has now raised almost $900,000 plus extensive in-kind support at its live collective-giving events in Sydney, Melbourne and Perth. TFN’s most recent event last week at Minter Ellison in Sydney, raised $114,000 for the four grass-roots non-profit organisations that pitched for support on the night: Heaps Decent, Sydney Story Factory, Curious Works and Gunawirra, That saw the total raised since TFN Australia began it events last year reach nearly $900,000, an extraordinary achievement given that pledges at TFN events start from just $100 per person. The Funding Network originated in the UK and was brought to Australia by Lisa Cotton and social enterprise pioneer, the late Steve Lawrence. Lisa Cotton serves as TFN Australia’s CEO. TFN hosts events at which four social entrepreneurs are invited to pitch for funding to an audience made up of TFN members and guests. Aiming to secure $10,000 each, the entrepreneurs pitch in turn for six minutes and answer questions from the audience for six minutes. They then leave the room and the pledging session begins. “The pledging is quite magical, it often takes on a life of its own as people get passionate about driving donations for their favourite cause, and everyone wants to see each project reach the $10,000 target. TFN’s model allows the audience to collaborate to produce results far in excess of their individual capacities. It also gives a voice to the small non-profit organisations and the people behind them. By connecting these innovative entrepreneurs face to face with the audience, TFN acts as a catalyst. As a result the organisations can find new networks, volunteers, board members, mentors and pro-bono contributions. And the audience gets to see a range of pre-vetted small organisations that they would not ordinarily come across, ones operating on the front-line of social change”. TFN provides the non-profit organisations, which are nominated and selected by TFN members, with pitch-training prior to each event and features each and its work on the TFN website. “TFN aims to broaden the culture and practice of giving in Australia by making it accessible, engaging, collaborative and rewarding for all involved,” says Cotton.